(Mr. COX of California asked and was given permission to address the House for 1 minute and to revise and extend his remarks.) Mr. COX of California. Mr. Speaker, today, one of our Nation's great leaders, one of our California leaders will be laid to rest at Arlington National Cemetery. He is a dedicated public servant and a gentleman. 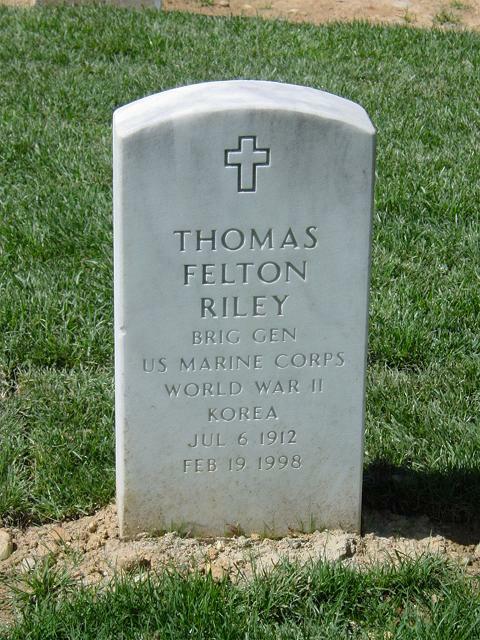 Brigadier General Thomas F. Riley passed away in Orange County on February 19, 1998. He was known to millions of us affectionately as just the General. Tom Riley embodied every virtue that we seek in our public service. He was born just 2 days after the 4th of July in 1912 in Harrisonburg, Virginia. He received his training as an engineer at Virginia Military Institute. And he went on to serve his country for just one year short of 30 years in the United States Marine Corps. He worked for another decade in the aerospace industry. Before 1974, President Reagan appointed him to fill out the remaining term of supervisor on the Orange County Board of Supervisors. He served for 30 years, nearly 30 years on the Orange County Board of Supervisors, where he was its chairman. In those years when he was not its chairman, he was always its most important person. He was reelected five times, always by large margins, to preside over what he always called the fabulous 5th District. General Riley served his community in many ways, not the least of which was his service to his church. He was a Catholic, and he was a member of the Knights of Malta and the Order of the Holy Sepulcher of Jerusalem. He was always eager to assist. One of his favorite charities was the Sisters of the Sacred Heart. General Riley helped establish a fashion show known as the Gentleman's Haberdashery, an event that has become a beloved tradition in Orange County. He was never alone in his efforts. His community was always anxious to serve him and to help him in his service. But most of all at his side for so long, for over 50 years, nearly 60 years, was his wife Emma Jane, who is with us today. She stood with him shoulder to shoulder in all of the hard work, and all the victories, and all the triumphs that he has achieved during a long life. I know that I speak for all of us in Orange County when I say that our hearts and prayers are with you and your family in this time of your grief. But we must remember that, just as General Riley was not alone in this life, neither will he be in the next. When he is laid to rest later today in Arlington National Cemetery, he will join the company of other American heroes whose watchwords were always duty, honor, and country. General Tom Riley was one of our heroes in California, and we will never forget him.